“Snow Scene at Shipka Pass” by Psy Guy under CC-BY-SA-3.0 (via Wikimedia Commons). This winter scene was captured on Shipka Pass, a 13km road that passes through the Balkan Mountains. Welcome to 2017! We hope everyone had an enjoyable holiday season. Winter Sweater Sale!! 40% off of the original price! With a new year comes new travels! We’re happy to say that our “Wanders' Wednesdays” resume on the 18th of January. They’re entertaining, informative, and will give you new ideas or inspiration for your own trips. This spring we have an excellent variety of slideshows, including plenty of hiking around the world and right here in our own beautiful backyard. We'll be kicking off the year with a show on chilly Antarctica and mountainous Nepal with Jeff Blumenfeld. Our first Packing Light Clinic is also coming up on February 1st, so mark your calendar if you're the type of person who’s always wheeling the heaviest bag around. We’ll help you lighten your load! Thanks again for all your support and we look forward to hearing about all the journeys you have planned for 2017! All shows take place at the store at 7 pm and are free! January 11th - No show. Enjoy some post-holiday recovery time! Join Jeff Blumenfeld at Changes in Latitude as he takes you on an adventure trip to Antarctica - the coldest, driest, windiest continent on earth. Learn about a journey to the frozen continent with North America’s brightest high school students - a trip that a favorite teen in your life can take someday. Jeff will also speak about the Nepal “Gift of Sight” Project, a humanitarian medical mission to a remote region of Nepal to provide quality eyecare to the people of this spectacular, but impoverished, country. He will show a 9-minute documentary that you’ll never forget. Have you ever started walking and just wanted to keep going? Join Clarissa as she shares her 500-mile walking adventure on the Camino de Santiago, taking the popular Camino Frances route from the Pyrenees to Santiago de Compostela and then onto Finistere, “the world’s end.” With two friends, a backpack, and a sense of curiosity, she - like thousands of pilgrims since the 10th century - discovered the power of earth, sky, and feet. Do you have a fun trip coming up? Have you never quite tackled the task of effective packing? Join us in this fun and informative clinic on how to consolidate your trip essentials. Learning how to pack light helps to reduce unnecessary stress and really can make your trip more enjoyable! We’ll teach you about packable fabrics, different packing methods, and travel accessories that make a significant difference. Whether you’ll be traveling for a week or several months, you can learn how to pack everything you need in one convenient and organized suitcase. 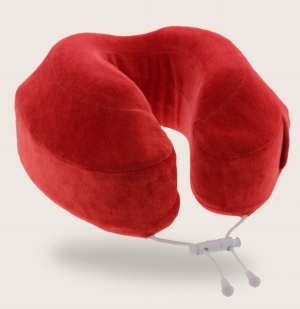 A good neck pillow can be hard to come by, which is a shame when it can make the experience of flying quite a bit nicer. So we're recommending one of our favorites: the Evolution Pillow by Cabeau. With raised side supports and soft-yet-supportive memory foam, this pillow can offer the comfort you’re looking for. We currently have both inflatable and non-inflatable varieties of neck pillows in stock. Come by and check them out! Try out the local cuisine… even in places where you automatically assume you wouldn't like the food. It can really help you discover a bit of the local culture, something that can be hard to do in some countries. Avoid the hotel dinners and nice restaurants occasionally, and instead pick up lunch from a street vendor or feast at a hole-in-the-wall establishment. If you're really uncertain about the food, you could ask a traveling companion to split something with you. You may even discover something about yourself (“Oh, how I do love the crunch of a freshly fried grasshopper!”), or find some dishes you may want to experience when you get back home (How can you only have a Mauritian Magic Bowl once?!). Bon appetit! Can you guess this location? Email your answer to adventure@cil.com for a chance to win a Changes in Latitude Gift Certificate! Hint: When this cathedral was first built in the early 1900s, it was the second tallest wooden building in the world (built without nails!). It is located in the largest city in a country that borders Russia and China (among others) and has a national drink consisting of fermented mare's milk. Last Month’s Answer & Winner: The December photo was of Fitz Roy, Patagonia. We had a lot of correct answers this month, so thanks to all who participated! The randomly selected winner is Norman Koren. Congratulations, Norman, for winning the Changes in Latitude Gift Certificate! A LOCAL CHANGES IN LATITUDE FAN, JONATHAN, TAKING IN THE VIEW AT RAISIN LAKE, YOSEMITE. Take a picture of yourself wearing a Changes in Latitude hat anywhere in the world and submit it to adventure@cil.com for a chance to win! Each month we will draw a winner from the monthly submissions and YOU can win a Changes in Latitude Packing Cube in any color or size you want! With your permission, we will add the picture and description to our new website under “CIL Faces Around the World.” Join in the fun! Sign up with your email address to receive our monthly newsletters and other store updates!